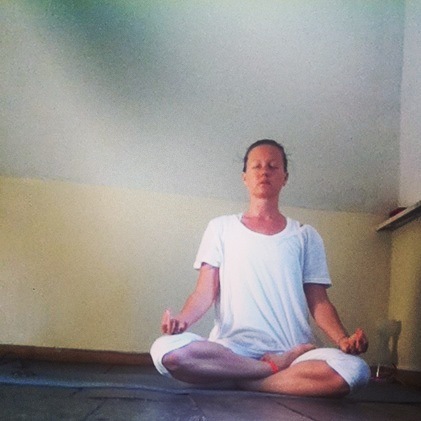 Home Yoga MomentWhy wear white? In yoga, the colour white represents the purification of the self, traditionally worn by students to differentiate themselves from the swamis, the teaching monks, who wore robes of saffron orange. Orange is the colour of spirituality and represents both the sun and fire; the guiding light of the spiritual quest and the transformative power of the practice. Strict adherence to practicing in white is observed by practitioners of Kundalini yoga, a very spiritual variation of Hatha yoga. And at Sivananda yoga centres across the world you’ll find teachers and serious students alike in white trousers and yellow t-shirts. During my teacher training course at Rishikesh Yog Peeth we were encouraged to wear white but the tradition was not enforced. Our teacher, Roshan Singh, asked us to continue to observe this practice once we’d qualified as teachers, reminding ourselves that the best teachers remain students all their lives. I’ve observed the practice ever since. I wear white because of these teachings, because I feel clean and because I don’t want my clothing to become a distraction from the teachings. In the teaching environment, teachers represent the ethos of the practice. We ask the students to concentrate on the teachings and not the appearance of the teacher and aim to present a distraction-free example of the postures, asanas. I also make an active choice to wear close-fitting clothes when I teach. When teaching any physical discipline, whether that’s yoga, dance, tennis or golf, it’s important that the students fully understand the alignment of the body required for safe and effective practice. To this end I prefer leggings to loose trousers. When I do wear my baggy white trousers I’ll roll them up above the knee to demonstrate the correct alignment for postures like Trikonasana (triangle). The same applies to the top half of the body, and I prefer a fitted vest or t-shirt to show the alignment of the chest, shoulders and spine. For me it’s also a practical matter: one end of my drawer contains the white clothing I wear to practice and to teach, which makes getting ready easier! I usually wear my hair up, again to help show the alignment of the neck and spine, and removing another distraction. I rarely wear make-up and literally never wear make-up to teach. Again, it’s a matter of removing distractions for the students and myself: it’s not pleasant to come out of class to discover your mascara smudged all around your eyes when twenty people have been looking at you for the last hour! And finally, yoga is at risk of becoming a commercialised, ego-centric practice in the west. This is the way our culture tends to develop anything that becomes popular. 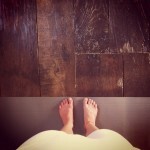 For me it’s paramount that yoga does not become a fashion-show, that we focus on the practice rather than what we’re wearing or – even worse – what the lady two mats over is wearing. This isn’t meant as a judgement against those who choose not to wear white. After all, it’s colour many uncomfortable with. But it is a reminder to make a conscious choice about what you wear. Ideally you’ll feel comfortable enough to forget your appearance and direct your attention inside, to fully revel in the transformative practice of yoga. Next ArticlePourquoi porter un vêtement blanc?